This is a featured item page, please use the menu on the left to return to the Books main page, or the options below. This title is a Galago exclusive and it is sold by Galago only. Ordering it is easier than you imagine. Get yourself a copy of the hottest 'private military' title in the market, i.e. while copies of this one-off print last. By Eeben Barlow, Galago, 2007. A Galago exclusive. Buy the book directly from Galago: for more information select the option that best applies to you. 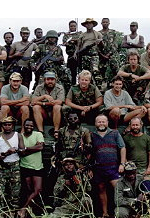 The book is sold by Galago, a specialist military publisher based in South Africa. Galago posts the book worldwide. Please select the option that applies to you for more information on delivery rates.